Call them punks, goths, or something else; love or hate The Black Album; The Damned continue to excite fans of all ages throughout the world. They are bringing their 40th Anniversary tour to The Belasco Theater Apr. 6, HOB/San Diego Apr. 7 and HOB/Anaheim Apr. 8. Concert Guide Live recently asked original guitarist, Captain Sensible, about the longevity of the band, red berets, “New Rose”, “fake news” and a whole lot more. CONCERT GUIDE LIVE: With The Damned celebrating their 40th anniversary, does it feel like a long time, or does it just seem like one long day? CAPTAIN SENSIBLE: That 40 years can be divided into a few distinct periods… the dawn of punk, when I was sleeping on Brian’s (guitarist Brian James) floor and we had to lie about the true nature of the band to get gigs… the chaos years when Smash It Up was our battle cry… the goth period when the band was once again instigators in a new musical genre… and after a fairly bleak decade, the resurrection, to which you have to thank the current lineup. It’s the longest lasting in the band’s history, not just because we get on – but also due to the new lease of life they’ve given to the early material. It’s weird being in a band… you tend to stay the same mental age as when you start out, which in my case isn’t saying much. Shame is, your body doesn’t… so the reckless lifestyle that earned me my name has had to be curbed somewhat. CGL: When the group began, did you and Dave (frontman Dave Vanian) ever imagine this sort of longevity? How did it happen! CS: I was only trying to break out of a cycle of unemployment and unskilled jobs… like my year as a 70s toilet cleaner – joining a band was my escape from that life. Life on the road isn’t everyone’s idea of fun, but I suppose we must be quite good at it to last all this time. Or, too dumb to think of any better way to spend our lives. Hey, but all the beer’s free! CGL: For a new generation of fans, describe the London music scene and how the band did or did not fit in at the start of things. CS: The various bands all had their own take on punk… The Clash sounded nothing like The Stranglers, the Pistols nothing like The Damned. We were just making the music we wanted to hear cos the mid 70s music scene had gone completely stale. Glam had been fun but had gone, leaving mega prog acts like ELP, Yes and Genesis, with their boring drum solos and songs about pixies and wizards. The Damned had the first record out because while the other bands were waiting for big money deals, we signed with a tiny indie called Stiff, doing it the ‘punk’ way. Stiff bands would be at the label HQ (a converted high street shop) helping to pack each other’s records, roadie at gigs, everything was ‘in house’… another artist (Nick Lowe) produced us. 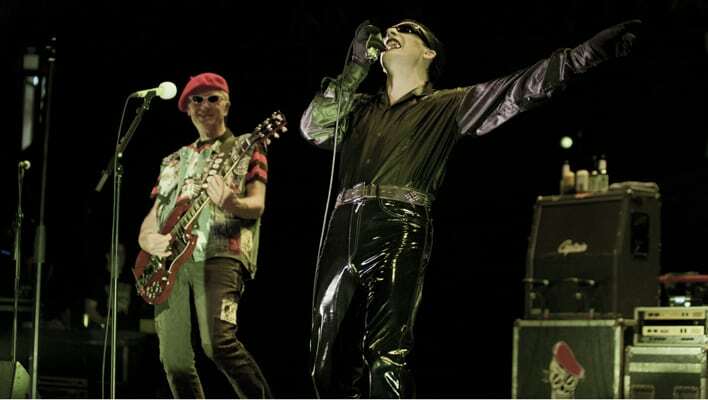 CGL: The Damned are in the midst of another world tour, how does playing live in the 21st century compare to the early days? CS: Better to go for it on our 40th as we’re getting no younger. Thankfully there was no YouTube in the 70s, as our performances could be a bit ‘erratic’. Debauched even. It’s rare to have a really bad gig these days. Pinch (drummer) describes us as a bunch of eccentrics who occasionally get together to make music. CGL: I understand a new album is in the works, how is it coming along? What has the songwriting process been like? CS: We don’t like to repeat ourselves… all our albums have a different sound. This one as well… there’s plenty of upbeat tunes… and some darkness, of course. Since our last release being 2008’s So, Who’s Paranoid, (a reflection on the UK’s CCTV culture), there’s been a steady stockpiling on new material and if we recorded it all, the album could be a double or triple CD collection. Sense would suggest we prune it down though. CGL: “New Rose” seemed to click with people right out of the gate, and here you are playing it many years later. How do you still connect with playing that song and some of the other Damned classics? CS: “New Rose”, voted last month by Kerrang as the best ever punk single… very nice of them. You had to be there when it was released to understand the effect it had…sounding radically different from all the ghastly country rock and disco that was around at the time, ours was really gnarled and manic, even when you play our debut album today it doesn’t sound like other records, almost UN-produced by Nick Lowe who was ALSO on Stiff. He’s captured the rasping chaos perfectly, the guitars don’t sound nice, they’re a distorted fuzzy mess, which is exactly what’s needed in punk rock, if you ask me. He understood where we were coming from, as our second album’s producer didn’t. Damned Damned Damned is very raw, even compared to the output of our 1977 contemporaries. Pathway was a rough demo 8-track studio, and Nick was known as ‘Basher’ Lowe, as he used to slap it down on the tapes – no messing about. It wasn’t really produced, especially in today’s terms where everything is cleaned up and corrected. It was dark and dingy in there so you had to be careful not to kick your bottle of cider over. We boshed it out in 2 days with a couple of days mixing, then the tape was recycled to record the Elvis Costello album, so you know there’s no chance of a remix ever. It certainly didn’t need any more than two days as we just repeated our live set until Nick was happy with it. “New Rose” is fun to play… bands all around the world do their version, I know cos someone will press a CD into my hand most gigs. CGL: How many red berets have you gone through? Where did the first one come from? CS: There was a gobbing element in the early punk days… lumps would bake in your hair under the stage lights. You’d have to spend ages in the shower combing them out, so I had a brainwave…. Wear a hat, and sunglasses. I went onstage once, a few years ago, without them… didn’t go down well. Went back in the dressing room, got the beret and returned to the stage to cheers. Oh well, it could be worse… Arthur Brown has to set his head on fire every show. I get the berets 10 at a time from a tourist shop near the Notre Dame Cathedral. You can’t wash them cos the colour comes out, so when they get too stinky I discard them into the audience. CGL: What is your pre-show routine? Do you get nervous before going on stage? CS: No, it’s a buzz playing a loud guitar onstage. And after the soundcheck there’s usually a mad scramble to find something vaguely edible near the venue. Not easy when you’re as fussy about food as I am. I often end up just gulping down a can of chick peas, maybe with an apple. Glamorous, eh?! CGL: What words of wisdom do you have for bands starting out today? CS: There’s some interesting bands coming out now, like Wand and King Gizzard… we like the garage psych thing… it still sounds fresh. They’re a good example of how to do it… Young bands should be careful not to overdo the Protools effects that are so common nowadays. Don’t sterilize and correct everything… perfection is overrated anyway. Far too many records have auto-tune vocals… it drives me mad! CGL: On a more serious note, does the current state of the world provide lyrical fodder? How are you responding to the chaos in the world today? CS: Don’t ask me about politics… I’m just a daft guitarist. Leave that to our trusted elected representatives, who somehow manage to answer not to the voters but to the corporations who so generously fund them. I’m loving the debate about ‘fake news’… that’s been a long time coming. People don’t like wars… they have to be lied into supporting armed interventions, and we have to learn from previous examples. In the UK there was a genuine thrill when the Tories were booted out by Blair’s ‘New Labour’ project. But then they took us straight to Iraq via ‘dodgy dossiers’ (lies) and a whole bunch of ‘fake news’ from the mainstream media. CS: We are all ale snobs, so if any brewery owners are reading this, please drop off a few bottles of porter – or better still chocolate stout at the stage door.